In 1977, Brazilian soccer star Pelé posed for Andy Warhol, who snapped a photo to use in the creation of one of his iconic screenprints. But Pelé didn’t need Warhol to immortalize him; he was already arguably the greatest player in the world’s most popular sport. And that sport, now raging in cities across Brazil as part of the 2014 World Cup, also happens to be one of the world’s most ancient games. Carved on one ancient Greek pot from Athens, a man balances a ball on his knee as a young child looks on. 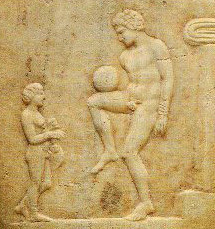 The man is playing episkyros, an early foot-based game that involved opposing teams competing on a rectangular field. The boy could be his son, and it’s easy to imagine that the father’s teaching the boy the rules of the game, just as so many dads do today. The Romans later adopted episkyros and renamed it harpastum. 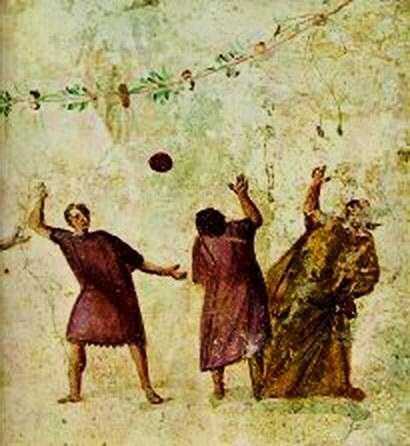 One ancient fresco depicts four men frozen in action as the ball hangs mid-air. Though faded, it still reverberates with a bit of the same lively energy that ricochets across soccer fields today. 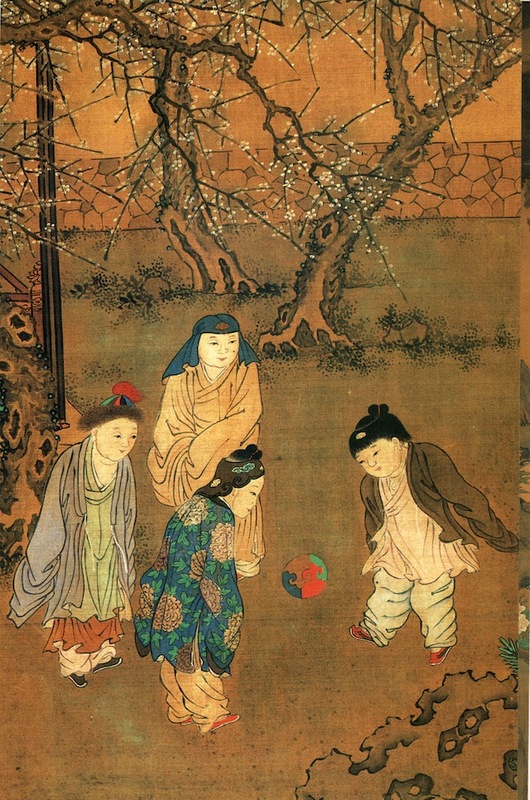 The Chinese game cuju is depicted in Su Hanchen’s delicate painting “One Hundred Children in the Long Spring.” The object was to kick the ball through a net without using hands — what FIFA has described as “the very earliest form of the game for which there is scientific evidence.” (Some say the Yellow Emperor, who ruled almost 5,000 years ago, invented it to use in military training). Unfortunately, it faded from popularity during the Ming Dynasty, and today, China is ranked as having one of the world’s worst soccer teams.